The icon of the Arctic, the polar bear, is the ultimate survivor in one of the harshest areas on Earth. Reigning over a world of ice, tundra, and snow, this carnivore would seem to have a lineage that traces back to some mammoth creature of the icy regions. But in fact, the polar bear’s closest ancestor is a land carnivore we associate more strongly with our forests. Over the years, scientists have uncovered an evolutionary path suggesting that polar bears are a relatively new species, and actually a subspecies, of Ursus arctos, more widely known as the brown bear. Scientific evidence has found that the brown bear, a species that also includes grizzly bears, was a “precursor” to polar bears, which then went on to develop specializations for inhabiting the harsh Arctic. Proving their genetic compatibility, brown bears and polar bears can mate and produce viable, or fertile, offspring. It is this reproductive viability that establishes that an animal belongs within a given species. In 2006, a hybrid grizzly/polar bear, which some call a “pizzly,” was discovered in the Canadian Arctic, providing researchers proof that polar bears and grizzly bears can interbreed, even in the wild. And when researchers in Alaska compared the DNA of brown bears from around the world, looking for genetic links, they made an interesting discovery about one population of brown bears in particular. Analysis of the DNA of a distinct population of brown bears living on Alaska’s ABC islands, 900 miles south of the nearest polar bear, revealed that the ABC bears were even more closely related to polar bears genetically than they were to other brown bears. So just when did polar bears arise as a separate subspecies? Genetic models show that the emergence of the polar bear could have taken place as recently as 70,000 years ago or as many as 1.5 million years ago. For many years, a fossil found at Kew Bridge in London was considered the oldest polar bear specimen. The fossil then placed the evolution around 70,000 years ago. But recently, scientists uncovered a fossilized jawbone from an island in the Arctic Ocean midway between Norway and the North Pole, dated to be at least 100,000 years old. Scientists believe this jawbone may represent the remains of the oldest-known polar bear, thus marking the appearance of the polar bear earlier than previously thought. Relying on the fossil record and DNA analysis, scientists have been able to arrive at a clearer picture of the polar bear’s evolutionary path over the millennia. Some 200,000 years ago, when glaciers covered much of Eurasia, the Arctic Ocean was completely frozen. 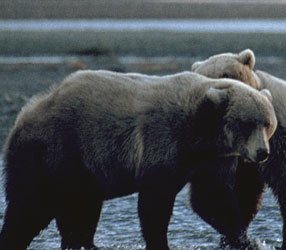 It was during this challenging period that brown bears began to wander in search of food. Approximately 125,000 years ago a population of brown bears in the far north of their range was likely split off from their brown bear ancestors, perhaps because of competition for food. The population likely became isolated by massive glaciers and, while most died in the harsh environment, those bears with an evolutionary advantage — ideal coat color and thickness for extreme cold — survived and bred. Over thousands of years, this population of bears underwent further evolutionary change, adapting even more specialized traits for surviving the harsh polar environment. When life in the North demanded teeth better shaped for ripping apart seals than munching berries, the polar bear’s molar teeth changed significantly from those of the brown bear. The bears also grew white fur, which camouflaged them in their snow-covered surroundings and gave them a hunting advantage. Scientists believe that at first these bears scavenged seal carcasses that had washed ashore, and gradually began to hunt the seals by waiting at the water’s edge as the seals surfaced to breathe. This is believed to be an important step in the evolution of a new subspecies of bear — Ursus maritimus or the polar bear. Nature once exerted such extreme pressure on the brown bear that it eventually gave rise to a new, better-adapted subspecies, the polar bear. Now, once again, evolutionary forces are acting on this long-enduring species. As the Arctic warms, the polar bear’s unique specializations that once lent it an evolutionary edge, may now be the creature’s downfall. A changing climate may name a new king of the Arctic — the fierce and opportunistic brown bear.